A little over 2 months ago, I signed up for something Foodie PenPals. Lindsay over at The Lean Green Bean and Allie over at Healthy Balance, Healthy Lifecame up with the idea for people who blog and people who read blogs to be part of a penpal style exchange of foodie items! It has introduced me to many new blogs that I love. 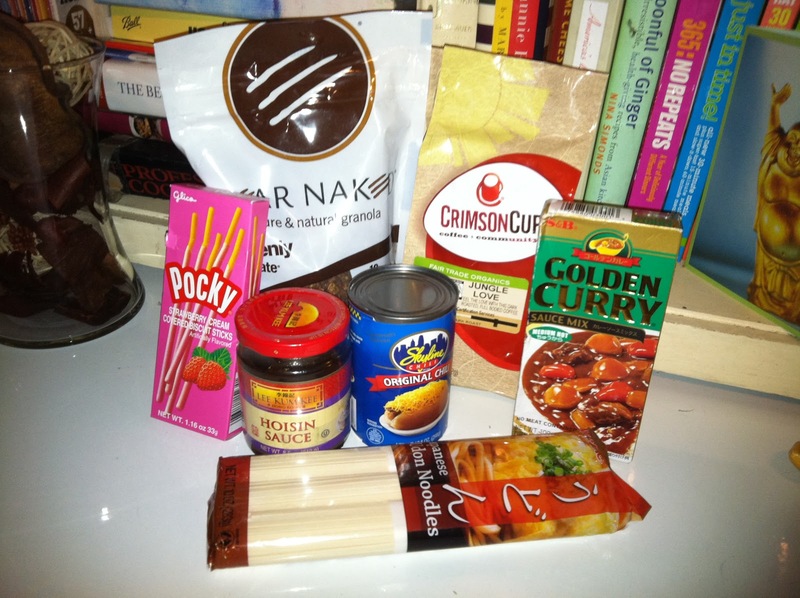 I sent a package over to Sarah at Sarah Snacks, check out what I sent her! I was paired with Jill, who sent me a seriously awesome package. We emailed back and forth a bit and I couldn’t wait to get it! Check out my goodies! I don’t know who was more excited, me or my boyfriend! He worked for several years in an Asian restaurant that served more authentic cuisine. He cannot wait to cook me dinner with some of these ingredients. Pocky – a cracker like cookie dipped in a strawberry yogurt. Crimson Cup – coffee! Holy YUM! This was one delicious cup of coffee. Hoisin Sauce – Jeremy can’t wait to cook me something yummy. I can’t wait to use it with the recipe that Jill enclosed! Skyline Chili – loved Jill’s note: Is this chili awesome? No, but it is what people think of when they think chili in the area. Udon Noodles – He tells me he already has something in mind. I can’t wait to share what! The Pocky and Bear Naked is all but gone already, the coffee has been seriously dipped into. Now we just need a quiet night at home to do some cooking! Sweeeeet! Enjoy the meals that will be prepared for you!